DETROIT, Jan. 9, 2018 /PRNewswire/ -- For OEM customers and the North American aftermarket: Recaro Automotive Seating, the global leader in performance car seating, showcases an extended portfolio at the North American International Auto Show 2018 (NAIAS) in Detroit. Adient's premium brand is presenting the all-new modular Recaro Performance Seat Platform (RPSP) for OEM applications, an SUV performance seat and three new products for dynamic driving fun to reinforce the U.S. aftermarket business. "With our modular RPSP we are making a strong statement to our OEM customers in the U.S.: This new generation product platform is a customer-focused solution to meet the increasing demands for performance, safety, light weight, comfort and design, addressing a broad range of performance and luxury vehicles," says Martin C. Klein, head of Recaro Automotive Seating. "At the same time we are demonstrating our strengthened engagement on the U.S. aftermarket with three new performance seats for the American car enthusiasts scene." At this year's NAIAS, Recaro Automotive Seating is showcasing two applications of the Recaro Performance Seat Platform (RPSP): They cover the whole performance seat range, from a slim, "reduced to the max" version in lightweight design to a demonstrator with advanced features and design innovations, such as a visible, carbon fiber-woven backrest structure, aiming at the top luxury segment. An RPSP half-cut allows inside views of the special hybrid structure, which uses a combination of composite organo sheets and metal components. Recaro's "SUV Performance" seat on display targets compact sporty utility vehicles combining advanced driving comfort with a dynamic attitude. As a result of extensive test driving, this concept offers exceptional comfort and riding performance especially suited to SUVs, with seat features like adjustable side bolsters in the backrest, a flat seat cushion for easy ingress/egress and the superior Recaro design. It provides an anatomically shaped structure and a low H-Point for excellent feedback from the road. The eye-catching Recaro Pole Position SL street legal limited-edition model for the U.S. aftermarket combines clean design and sportiness with high-quality manufacturing and craftsmanship. This purebred shell seat is made for sharp-looking interiors and the finest in dynamic driving pleasure. 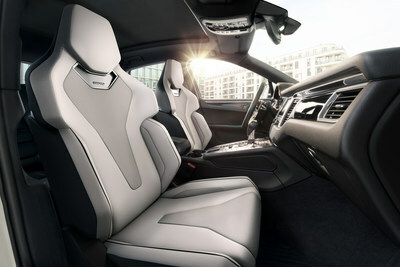 Limited to 300 pieces, the model is distinguished through unique Recaro styling elements, including an embroidered logo and elegant aluminum plaque with the seat's serial number. Despite its SOP in January 2018, only a small number of Pole Position SL seats are still available. Another all-new Recaro aftermarket seat at this year's NAIAS is the Speed V: a true bolt-in seat kit designed specifically for American sportscars. It was inspired by the classic Recaro racing shells, designed for firm and dynamic support during high-performance driving. The new seat combines the look, feel and support of a racing generation seat with all the necessary comfort for every day driving. Recaro Automotive Seating also introduces the Sportster GT: With its long-standing history as one of the most successful sportive car seats in the world, this new seat addresses today's top sport luxury automobiles, representing the latest in aftermarket seating technology. Its lightweight structure provides Recaro's world-renowned performance ergonomics and excellent body support. Recaro Automotive Seating's exhibition is part of the Adient presentation at NAIAS 2018 in Room 310B, Cobo Center. Adient is a global leader in automotive seating. With 85,000 employees operating 238 manufacturing/assembly plants in 34 countries worldwide, we produce and deliver automotive seating for all vehicle classes and all major OEMs. From complete seating systems to individual components, our expertise spans every step of the automotive seat-making process. Our integrated, in-house skills allow us to take our products from research and design all the way to engineering and manufacturing – and into more than 25 million vehicles every year. For more information on Adient, please visit adient.com.